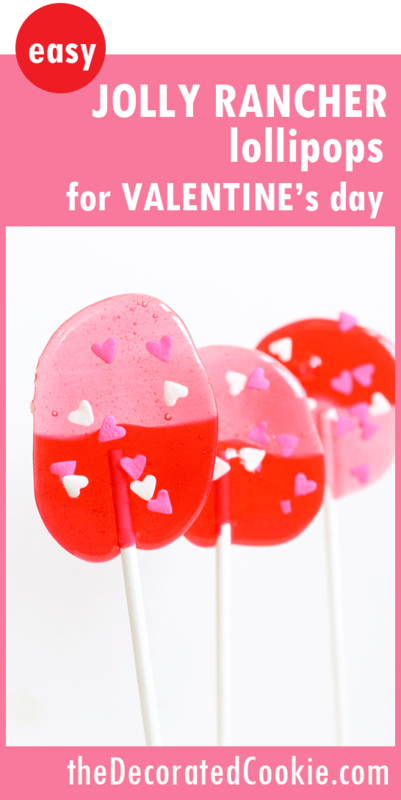 Use store-bought candy to make easy Jolly Rancher Valentine’s Day lollipops. Oh, the Jolly Rancher lollipop. 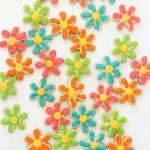 I made my first batch of easy Jolly Rancher lollies almost five years ago. 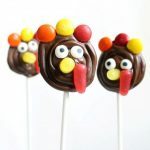 Then that second batch of Jolly Rancher lollipops I made bigger and better. 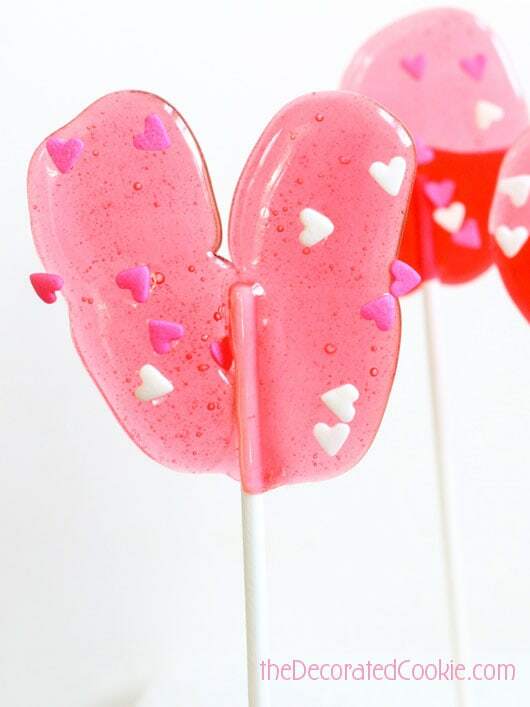 And I made these flower candy pops two years ago. So it’s time to revisit the Jolly Ranchers. 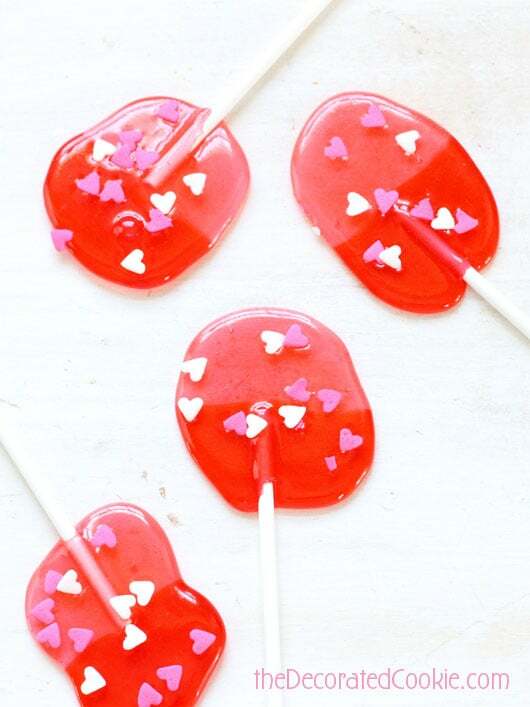 Here are some Jolly Rancher Valentine’s Day lollipops. 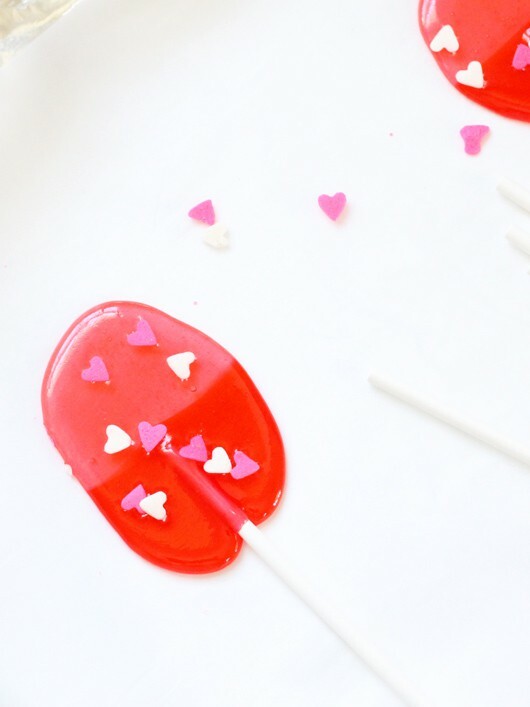 There really is nothing to making these Valentine’s Day lollipops. 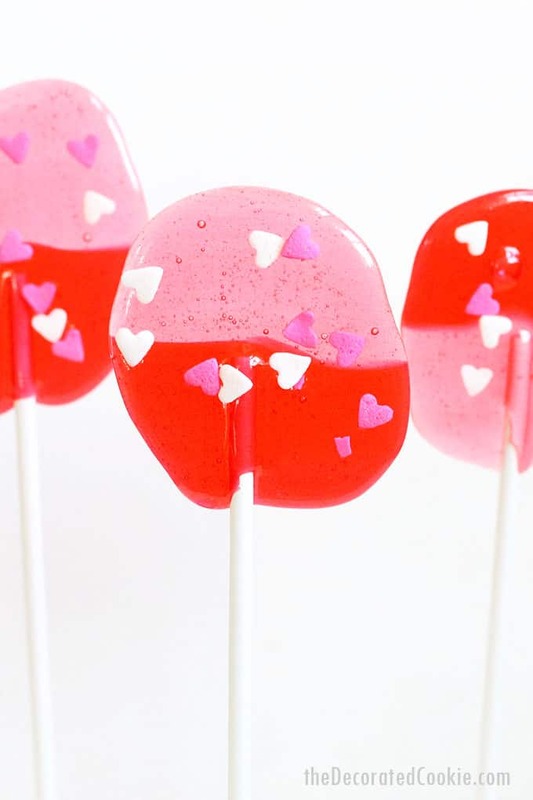 You place some hard candy on a tray, melt them, and add some sprinkles and a lollipop stick. That’s it. 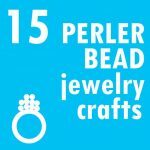 They are easy enough for kids to help make. But, just to be all formal, I’ll give you the more formal looking instructions below. I even made a heart. 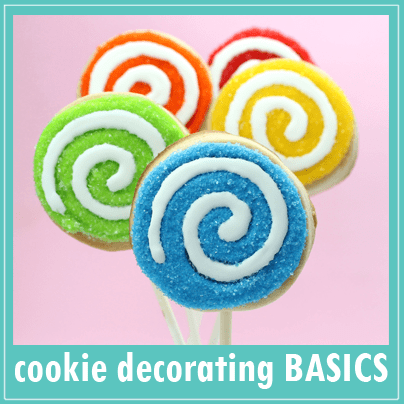 *Find the lollipop sticks (6-inch used here) and sprinkles in the craft store. 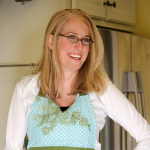 Preheat the oven to 275º F. Line a baking tray with foil and place a piece of parchment paper on top. 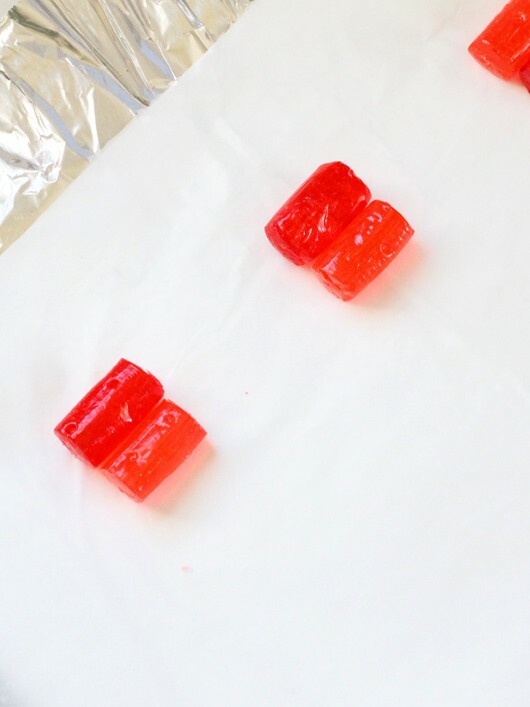 Take two red Jolly Ranchers (either two Watermelon flavors, two Cherry or one of each, as shown here) and arrange them on the tray. 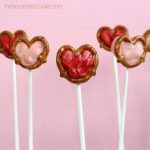 Don’t arrange more than a few lollipops per tray, as they will need room to expand and you’ll need room to add the sticks later. 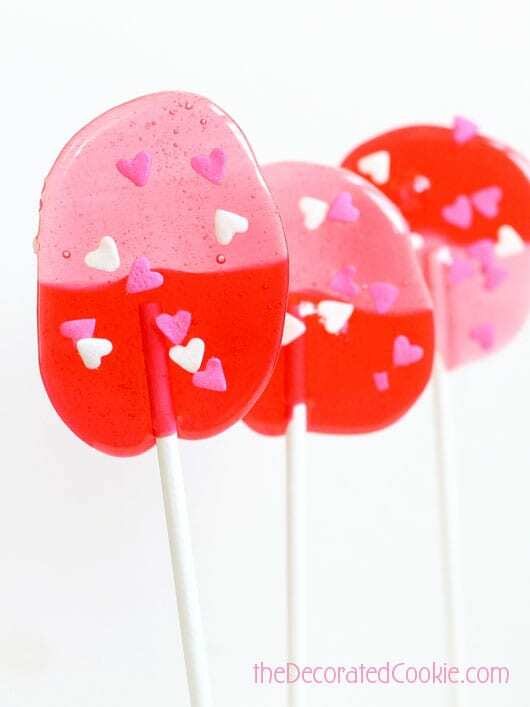 You can also add more candies to make the lollipops bigger. Place the tray in the oven, making sure none of the candy is jostled. Bake in the oven just until the final lump of candy melts. Mine took about 7 minutes, but watch them closely as they melt. 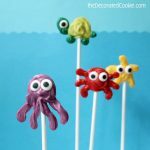 Immediately (and carefully) take a lollipop stick, place it on the melted candy and rotate it until it’s covered with candy. 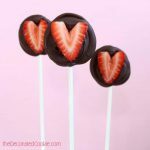 If desired, sprinkle some heart sprinkles or other Valentine’s-themed sprinkles on top. 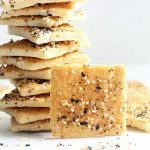 Let the pops cool completely on the trays before removing them. 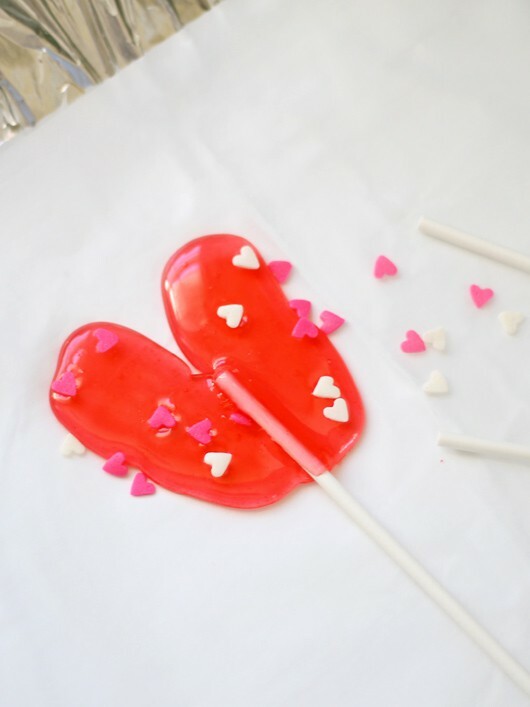 I had some success making heart shaped lollipops, though the candy has a mind of its own when melting and spreading, so this can be an exercise in frustration. 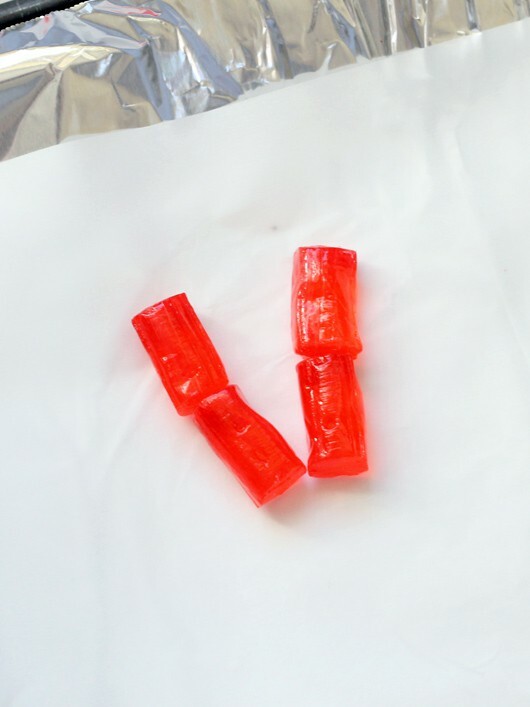 But I arranged four candies in a “V” shape. 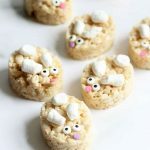 These took an extra two minutes or so to melt. Try these at your own risk. I had a few that looked very much not like hearts. 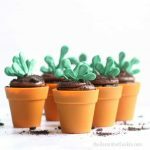 These are super cute, perfect to make with the kids and not messy at all.